Eva Marie Cassidy was born on February 2nd, 1963. Music was introduced to Eva at an early age by her father, Hugh - who surrounded her with the voices of Pete Seeger, Buffy St. Marie and Ray Charles. He taught Eva how to play the guitar and she learned to accompany herself and her siblings (Anette, Margret and Dan) in a family music group. As a teenager, Eva sang with friends in several bands and groomed her musical talents and performance skills. By the early 1990s she was doing studio work, performing with her friends - and then recorded "The Other Side" with Chuck Brown. Eva's career turned a corner that would lead her to pursue more solo work. She developed a repertoire of "great" songs that inspired her, and would later be the reason we all remember her - not for songs she wrote, but for songs that she interpreted and made her own. Eva's voice was recorded at many of her performances at local Annapolis and Washington DC venues, and at studio sessions - little did we all know that this was a miracle. Eva's young life was cut short on November 2, 1996, by cancer. She was surrounded by music her entire life - now she surrounds our lives with her music. 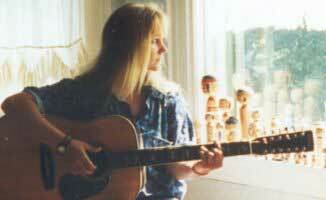 Many are familiar with Eva Cassidy the singer, but may be unaware of Eva's earlier passion for art. She began scribbling and coloring daily by age three. Even then, her stick drawings were advanced for a child. A picture of Nipsy Russell dressed in a tuxedo, standing before a microphone, showed unusual detail and accuracy for a four-year-old. Eva was quite taken with the subtle shades of light and shadow. We saw with "new" eyes, when, as a child, she brought the changing light to our attention. Most of her work concerned nature, particularly trees, water, clouds, and faces. Her pictures in later years often contained her surrealistic "bubbles"--about which we have no explanation. Much of her skill came about from obeying the urge to forever doodle and sketch (most often in school). So, there were countless faces of teachers and classmates as well as the great outdoors and close-ups of miniscule flowers. It was clear early on that music and art were her two passions. And that included beadwork, clay figures, and film animation. Her favorite modes of travel--hiking and biking--were the means for searching out the distant beautiful places and music venues which provided the inspiration for her endless creativity.